The Kiplinger Chair at The Ohio State University. The Alex Laurie Award (American Society of Horticultural Science) for outstanding research in horticulture. The Outstanding Teacher Award from the Professional Greenhouse Growers of Georgia. The Futura Award for outstanding teaching and research from the Professional Plant Growers Association. The Golden Trowel Award for his book Allan Armitage on Perennials from the Garden Writers of America. The Education Media Award for his book Specialty Cut Flowers from the Professional Plant Growers Association. The Teacher of the Year from the Georgia Green Industry Association. The Gold Medal from the Massachusetts Horticultural Society for Exceptional Service in American Horticulture. The Distinguished National Educator Award from the American Horticultural Society, the highest award for teaching in the country. The Medal of Honor, the highest award possible from the Garden Club of America. The Brooks Award for Teaching in the College of Agriculture and Environmental Science' at UGA, the highest teaching honor from the College of Agriculture. The Josiah Meigs Award, the highest possible teaching honor from from the University of Georgia. The Horticulture Initiative Award, presented by the Southeast Greenhouse Growers Association, due to his direct enhancement of the economic well-being of the horticultural industry. The Award of Excellence, the highest honor given by the National Council of State Garden Clubs. The Award of Merit , the highest award possible from the Perennial Plant Association. The first recipient of the Medal of Excellence from Greenhouse Grower Magazine, awarded to the individual most responsible for leadership in the new crop development. The Allan Armitage Leadership Award, established by the Association of Specialty Cut Flower Growers to be awarded to the individual who exemplifies outstanding leadership in the specialty cut flower industry. 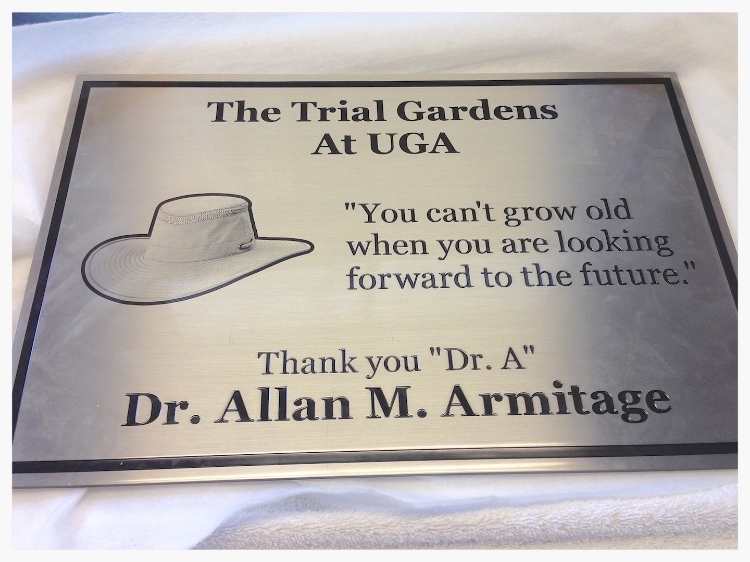 Dr. Armitage was the only living person chosen among the top 10 “Spheres of Influence” in the floriculture business by his colleagues. The University of Georgia Alumni Award, a prestigious award based on excellence in teaching, research and extension. The Scott Medal and Award for contributions to American horticulture by the Scott Foundation in Swarthmore, Pennsylvania, arguably the most prestigious honor in ornamental horticulture. The Garden Writers Association Award for Magazine Writing. The International Horticulture Award from the Newport, Rhode Island Flower Show for lifetime contributions in the field. The Hutchinson Award for lifetime achievement in horticulture from the Chicago Botanic Garden. The Medallion of Honor for outstanding achievement in horticulture from All America Selections. The George Robert White Medal of Honor from the Massachusetts Horticultural Society. He also served as an advisor for the Garden Book Club of America and has consulted for Scholastic Books, publisher of the Magic School Bus series of science books for children.